How is your past negatively impacting your present? How is your past positively impacting your present? What piece of baggage do you most want to leave behind? Receive It. Our past doesn’t change, but the way we view it and use it changes – thankfully. The change doesn’t automatically happen. We can cling to the past so tightly that it seems the same or even worse than it did when we experienced it. We can also misconstrue it in a way that unrealistically paints a beautiful picture over something hideous. Neither is helpful when we respond out of our own desires and preferences. God alone is the redecorator of our lives. He determines what needs to be tossed aside, recycled, reused or handed down to someone else. Baggage is not always a bad thing. Our experiences of yesterday prepared us for today. We don’t see the benefit in every situation. Some situations are simply filled with pain. We might never see the benefit, but if we can’t see God using it in our lives, we don’t need to carry it with us on a daily basis. Just because something is in our past doesn’t mean it needs to become the filters through which we experience everything. Only God needs to serve as our filter. When we let him sift everything, he brings to the surface what is necessary for a particular day, situation, season or relationship. Unless God can use it, we don’t need to regularly access it. It’s part of our baggage, but it’s in storage until God unpacks it and says, “I’m going to use this to grow you or someone else. Don’t worry. I’ll help you work through it, and when we’re done, I’ll repack it.” We can’t ignore or lug the weight of our pasts. Let’s let God decide the perfect timing of packing, unpacking, repacking, and purging. Live It. As you pick up your purse today, ask God to reveal to you what needs to be packed for your day. Carry no more and no less. It’s a bit easier to perpetuate the cause and effects of hurt when you hang out with a group that isolates itself and allows the hurt to multiply. We all need reality checks, and we don’t get them from the people closest to us if they’re not willing or able to shine a revealing light on the truth of a situation. We connect with people because we have things in common with them, so we affirm one another. However, when the affirmation becomes a crutch and pulls a blinding shade over accountability, we’re in trouble. We need to choose friends who love us just the way we are yet aren’t content to leave us there—just like God. Affirmation is great as long as it’s biblical. However, our circles of friends—even in churches—can become gossip fests. Once the can of gossip is opened, it’s incredibly difficult to secure the lid on it, but the effort is worth it. We do a lot of damage spreading hearsay or gathering breakneck momentum based on our opinions instead of factually-based information and biblical truth. When our small groups of friends or Bible study groups begin to share opinions and gain momentum of what we think is happening or should happen with an individual or the church as a whole, it’s not long before we take the small leap that rationalizes we’re being “led by God.” Just because we’re a group of Bible-believing church folks who come to a consensus doesn’t mean our conclusion is God-directed. Were biblical principles followed throughout the process of coming to the conclusion, or was there misguided rationale, misinformation, and inappropriate sharing? You cannot reach a Spirit-led result with a man-led process. There are many boundaries drawn between the “us” and “them” in churches. It can be old versus young or paid staff versus volunteer staff. It can be “old-timers” versus new members or regular attenders versus members. The division of groups is often perpetuated by assumptions. Because we tend to hang out with people most like ourselves, we quickly make assumptions about other groups as well as about what those groups must think about us. It isn’t long before we feel slighted, justified, or entitled, and the space between the groups widen. The way to build a bridge between groups is to get to know individuals in other groups. It takes effort, because we have to reach across the aisle to approach the very people we have some unflattering assumptions about. We might find some aspects of the assumptions to be true, but we’ll likely find many more exceptions if we open our eyes and hearts widely enough to recognize and acknowledge them. If each person in your circle of camaraderie gets to know three people in one of “the other” circles, how many assumptions would be proven right and how many would be shaken or shattered? It’s worth a try to find out. Test the all or nothing perspective. God’s family is certainly not exempt from hurt, including the hurts that come from within. People in churches are just as vulnerable to unjustly criticize, gossip, neglect, and offend one another as anyone else. It’s true that God sets us apart to reflect his image to the world, but to believe Christ-followers are perfect representations of Jesus will, to say the least, lead to disappointment. What (should) set Christ-followers apart from the world is how they deal with one another to heal the hurt. Will they do the hard work it takes to unite or will they further divide into quarreling, backbiting, judgmental factions? Which will you choose? 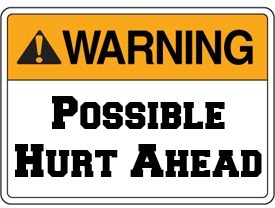 Healing the Hurt , is PurePurpose.org’s current series to help hurting communities cope in biblical ways. Music Monday: Are you missing someone this Christmas? Christmas brings such a variety of feelings with it: wonder, excitement, confusion, hurt, grief, loneliness, anticipation, and joy. We tend to focus on the positive ones and try to hide those we think of negative. But perhaps they’re not as negative as we think. After all, grief helps us remember the moments we miss. Mixed in with grief is often joy and honor to have the memories we have. Yes, we might also have regret and confusion, hurt and loneliness, but we don’t have to hide it all, masking it with a smile, presents, and busyness. Perhaps you’re approaching Christmas this year with a huge gap in your life and heart. You are not alone. “No. I’d rather not know,” was one of their replies. I wasn’t offended. As I said, it was simple conversation. We continued to the meeting, made our presentations, and were just getting ready to leave when one of the women mentioned it was a struggle for them to be there, because her husband (who was related to the other woman, too) had been killed in an accident years ago at the same factory. Of course, I apologized, more than once, including a note I sent soon afterward. They assured me I had no idea of knowing and were in no way offended. It was healing for them to be on site. I still felt awful. What would make me say such a thing? I meant no harm. I began to wonder how insensitive our words can be even when our intentions are pure. We can’t possibly know all the details. But we need to pay attention to clues into what’s going in people’s lives in any situation we’re in. We need to be sensitive. And on the flip side, we need to remember no one knows everything about us, especially people with whom we have limited contact. So, when people say something offensive or hurtful, perhaps we should give them grace and forgiveness. I know I certainly appreciated it. My hotel room wasn’t the quietest one I’d ever had. It was in a nice neighborhood. It wasn’t cheap. But…it was in the medical district of a large city, and I heard emergency sirens throughout the evening and night. When I heard the first few in the afternoon, I wondered how I’d ever get a decent night’s sleep. As I settled in to write that evening, God reminded me that noises and other distractions aren’t always bad. Sometimes, they are reminders. It really didn’t matter if I got a decent night’s sleep; perhaps waking up to a siren and taking a moment to pray for the person who was suffering, his or her family, and the medical personnel–all who were not getting a decent night’s sleep–was the best use of my nighttime. Sometimes the distractions around us aren’t good ones, but sometimes they are. 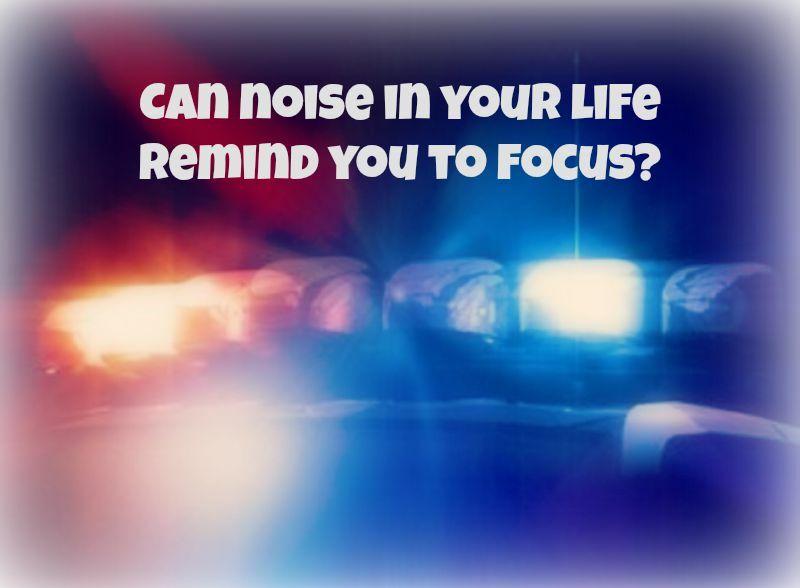 Before you get annoyed today by an interruption or surprising noise, pause long enough to discern where your focus is supposed to go. Spend time as God intends.